Fiber Optic Homecoming Dress #WearableWednesday « Adafruit Industries – Makers, hackers, artists, designers and engineers! How can you make any dress a light up dress? An easy method is fiber optics and lots of hot glue. The first step is to plan out your project. One tutorial can’t cover every option, but I will cover a feminine and a masculine look. I recommend reading the tutorial to the end before deciding on your plan. When you plan your look consider if you will modify the clothing itself or make a detachable lights set. 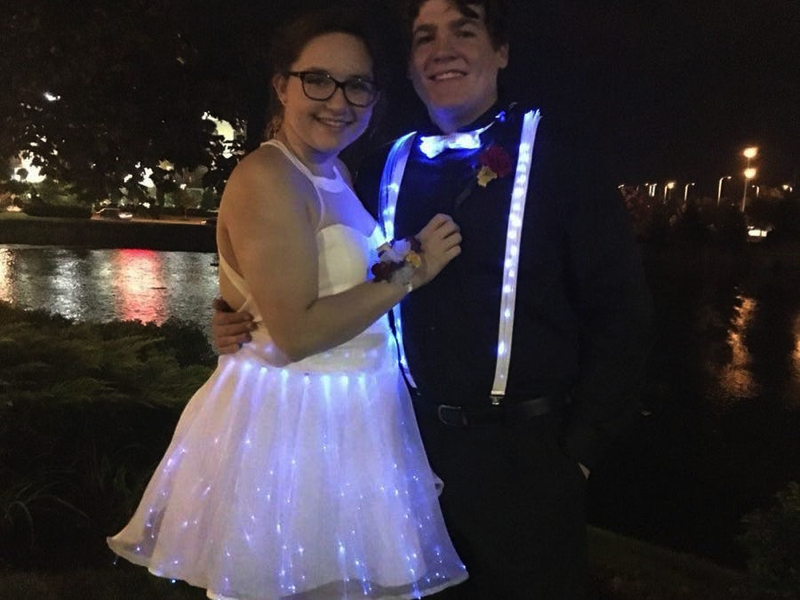 The light up portion of my dress is a Velcro skirt that goes on top while the suspenders and bow tie have lights hot glued to them. Consider where you want the ends of your fiber optics, which is where the light will shine, and where you want the fiber optic cables to run to, which is where your LEDs and wiring will go. Once you plan out where you want your LEDs and how the optical fibers will be distributed it’s time to start producing your look by connecting your LEDs to the fiber optics. I bought 1.5mm optical fiber on Amazon for this project which came in a roll. The cables retained the circular shape so I had to straighten them for the skirt. Fiber optics can take any form you want them to but sharp turns can diffuse the light and make them dimmer, and heating the cables to desired shape can make them brittle. After shaping cables its easy to light them up. Using a 5mm RGB common cathode I was able to attach 8 strands to each light. To do so gather the strands in a small, tight bundle with the ends on one side closely gathered, and use electrical tape to keep them together. The bundle can be attached to the led with shrink wrap, and the connection should be secured with hot glue inside of the bundle and along the edges of the shrink wrap.